AS A GLOBAL LEADER IN DISTRIBUTION, ACTIVE AT THE VERY HEART OF THE ENERGY WORLD, Rexel is in a unique position to promote the co-creation of value with its stakeholders. 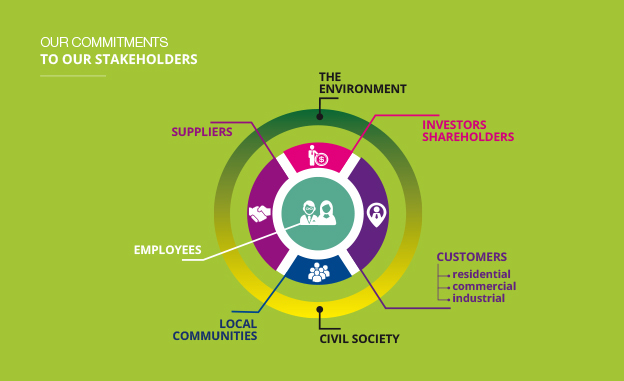 Rexel’s sustainable development policy is based on ﬁve key pillars designed to meet their needs and expectations. Developing innovative energy management solutions for our customers to help them optimize their energy consumption. Improving the environmental performance of our operations in order to help preserve the world’s natural resources and ecosystems. Engaging and supporting our employees in order to guarantee them good working conditions and motivating career opportunities. Promoting responsible practices in the value chain to ensure the respect of the environment and the health, safety and security of employees and customers. Improving access to energy efficiency for all to support civil society in the ﬁght against fuel poverty and to promote the energy transition.